In and out of my Chambers (11th edition), I learn that a "peninsular unit" is another term for a breakfast bar. Question: why wasn't the author who lived on a remote strip of land more widely read? Answer: because he used to pen insular novels. I'll stop now. Out, then, to the Shotley peninsula in the fashionably late ReneMobile. Via Manningtree or Freston? With me in the car, we'll have the latter. Glance left at what's left of the Suffolk Food Hall after last week's fire, past Das Boot, then no sleep 'til Holbrook. Somewhat easier to park here than our recent trips to downtown Ipswich, helped by the adjacent post office. 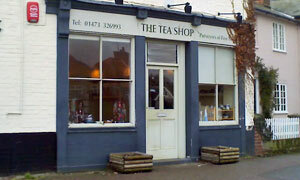 Ebay business done and clutching proof of postage slips, pop in to Popins, though the sign outside says The Tea Shop. Whatever, or as we say in this house, wevs. Phew: Grenvyle's beat us and put towels down on a table for four. Actually, there's a bulb of lunching ladies in the other corner plus us green onions, and that's shallot. Informative and helpful waitress stroke chef stroke helper-outer spells out today's options since there's no obvious menu (later, I spot it on an obscured chalkboard, coincidentally the name of a 1970s Dutch prog rock band). As in life, we make our choices. Rene goes all Hollywood by ordering off-menu: he'll have the full English breakfast, please. [Them] (jealously) We didn't get offered that! [Rene] (cool as a cucumber) Did you ask? It's Friday, it's 1:10pm, it's pick-a-cake! Choco-fudge for me, please. Also ordered a macchiato from the wall-mounted beverage menu, then had to describe it. Er, double espresso with a bit of foam, thanks. Mighty fine combo. Settled up, said sayonara and scooted off. If it was a car -- Toyota iQ. If they were passing by -- Jeanette Winterson.